1 2 3 4 5 Click to share your rating 24 ratings (4.4/5.0 average) Thanks for your vote! 15.07% of people buy Sylvanian Families: Triple Bunk Beds and Sylvanian Families: Double Push Chair. 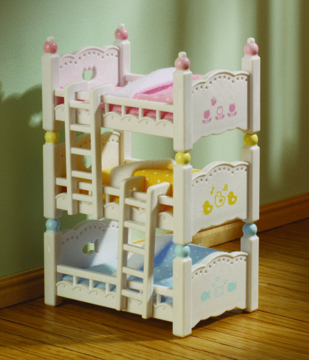 This set is a very cute design, but one of the beds broke quite soon with very gentle play. We have quite a large Sylvanian Families collection and it's always the same: the animals and tiny accessories (food, etc) are fine, but the furniture and houses are held together by such thin plastic that they break very easily. Great product. Very simple design which my 3yo figured out how to use almost instantly. 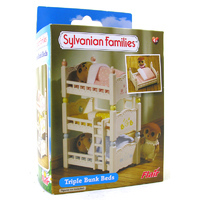 This is for the baby Sylvanian critters. 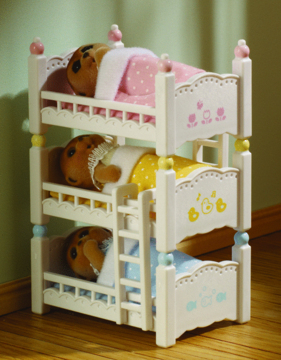 My 3yo really enjoys putting teddies ect to bed so she really enjoyed this!! Highly recommend it. Only recieved yesterday but has already got lots of play out of it. She loved this. It is very cute. Beds can be stacked together or separated. Includes three baby bunk beds that can either be used as three separate beds, or alternatively stacked three high, or any other combination you can think of. 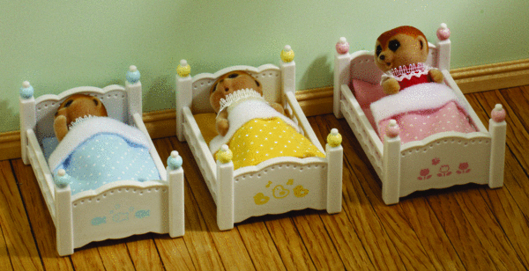 Bedding is included for each of the three beds.